Dicor Roofing Systems assures a watertight roof that is easy to maintain and saves energy through its heat reflecting characteristics. It is highly puncture and tear resistant, has superior tensile strength and withstands damaging UV rays. The membrane resists uneven weathering, fading or chalkiness. All Dicor Roofing Systems us the same three installation components: bonding adhesive, butyl tape and lap sealant. These elements can be purchased separately or as a package in the Dicor Products Roof Installation Component Kit. Diflex II™ is a new non-fleece backed TPO membrane from Dicor the RV Roofing Experts. Unlike standard TPO, Diflex II™ is extremely flexible and is as supple as most EPDM. 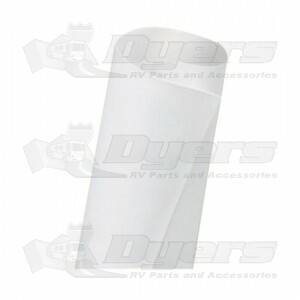 It easily conforms to most RV roofing surfaces for a snug, tight fit. Diflex II™ is embossed with a light pebble pattern to dull harsh reflections and provide a classic look. Diflex II™ is available in Dove (Bright White), Grey, Tan and Ivory and is compatible with all existing Dicor aftermarket cleaners, protectants, sealants and bonding adhesives. It is easily repaired - requiring no special sealants or adhesives! Grey, Tan and Ivory Diflex II™ can be installed with Dicor’s matching Lap Sealants for a fully coordinated, consistent appearance.